We’re not the kind of over-the-top dog owners that (unnecessarily) carry our dogs in strollers or provide a plate for them at the dinner table, but we do love our dogs as family and we treat them well. Part of treating them well is feeding them well and worrying about their diet and nutrition. We’ve struggled with maintaining Wiley at a decent weight, dealt with allergies and digestion issues. But these guys are super important to us so we do our best. 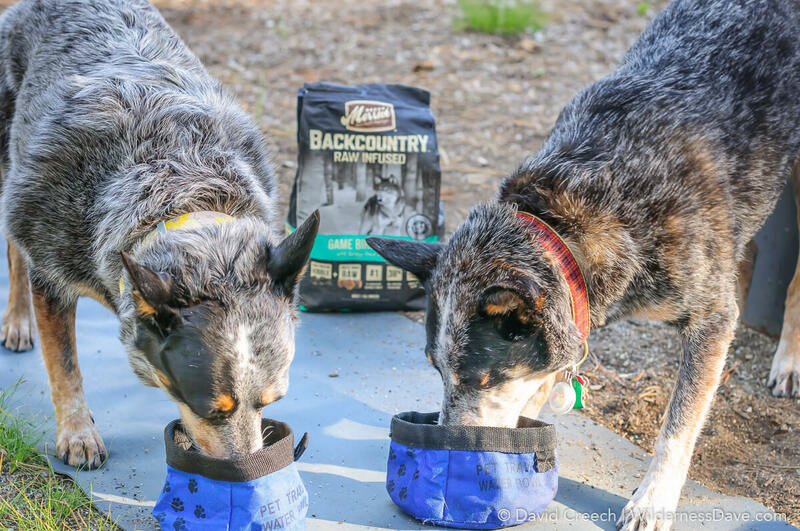 When Merrick Pet Care contacted us to be a part of their Ambassador Program associated with the launch of their new Backcountry line of food products, I had to really consider how it would effect our dogs before I agreed. Wiley has some food sensitivities that started causing problems with her skin and coat a few years ago. We moved her through a few products that our vet suggested and eventually landed on feeding her Wellness Simple diet dog food which is really basic and very expensive. But it worked and Wiley’s issues, for the most part, have gone away. She still seems to get seasonal allergy problems which, from part of what I’ve read, could be related to substandard nutrition. We’ve toyed with the idea of introducing a raw component to her existing diet…but just don’t know where to start. Max also has some challenges. He was a rescue and had come in to the rescue with some injuries suffered after a “fall” from a moving vehicle. He was patched up pretty well, but he still has some issues with his jaw and damaged teeth. We spent a fortune making sure he got to keep his canines and now have to be cautious about what he eats and how much he chews on his toys. Nutrition is so important for these guys. Not only for their overall health but as fuel for our play time at home and away. A friend said once, “Your dogs get more adventure than most people!” and he’s right. We often take our dogs camping, hiking, kayaking, paddleboarding, backpacking or on long road trips with adventure destinations in mind. We try to feed them well to insure they have the fuel to keep going as long as we do. 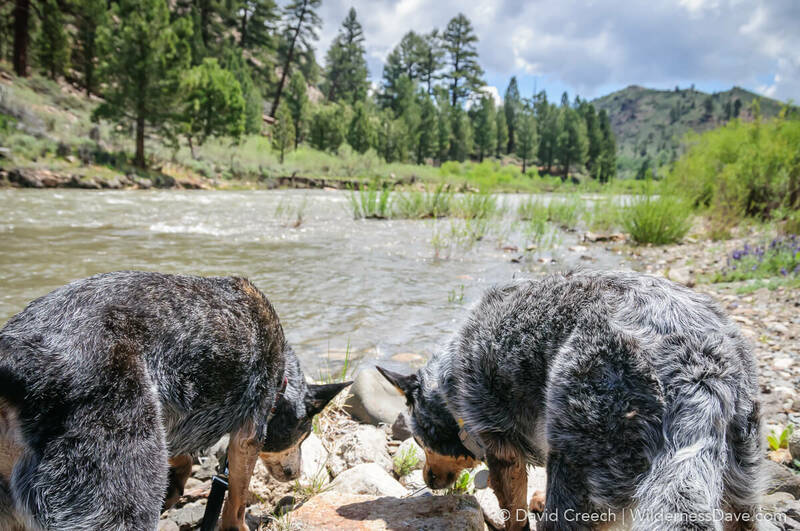 You can search #CattledogAdventures on Instagram, Twitter or Facebook to follow their adventures. 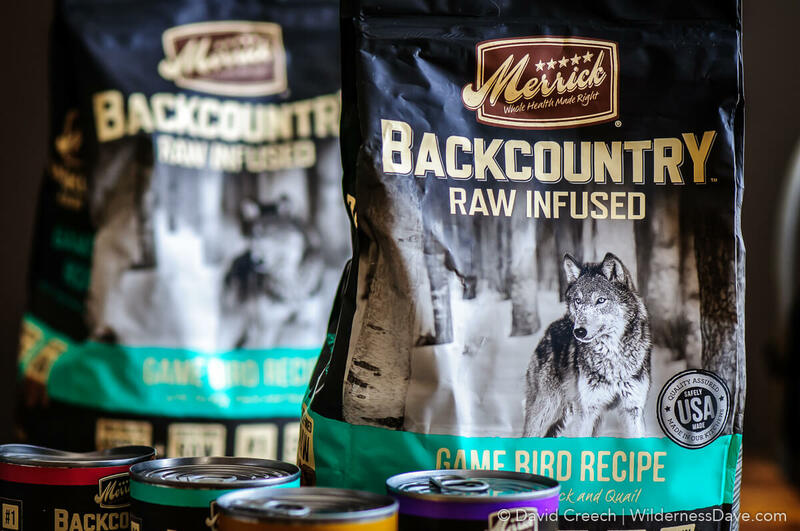 When Merrick Pet Care contacted us about trying this new line of food and being a part of their #Wild4Backcountry promotion I had some reservations and a lot of questions. With Wiley’s history of food sensitivities and Max’s teeth problems I wanted to make sure it wasn’t a waste of time having them try this new product. I asked about the ingredients, the processing, where the food was made and where the ingredients are sourced. My worry is always about food processed where regulations are loose and sourcing isn’t a concern. I also look for grain-free products after our experiences with Wiley’s reactions to other commercial dog food. Merrick was great about answering all of my questions and I was impressed with their answers. The food industry for a long time has agreed on the benefits of freeze-dried foods. It is a way to create shelf-stable food products without overprocessing or bastardizing the ingredient. The Merrick Backcountry RAW Infused dry kibble has good sized whole pieces of freeze-dried meat. We opted to try the dogs on the Game Bird Recipe kibble which is made with turkey, duck and quail and has freeze-dried whole pieces of chicken. It’s grain-free (no corn, soy or wheat), processed and packaged here in the states, has 38% overall protein, no artificial colors or preservatives and has nothing sourced from China (seriously, why is anyone eating anything from China?). We also got to try a variety of the wet canned food options available in the Backcountry line. These include some different meats than normally seen in dog food like rabbit and venison. I was especially impressed with the Chicken Thigh Stew recipe that actually includes whole bone-in chicken thighs, cooked to make the bone safely digestible for the dogs so they can get the additional nutrition it provides. The Backcountry kibble products are available in 4, 12 and 22-pound bags and range from $19.99 to $69.99 per bag which is comparable to what we were paying for the Wellness Simple Diet we had the dogs on before. The 12.7 oz cans retail at a competitive $2.99 per can. 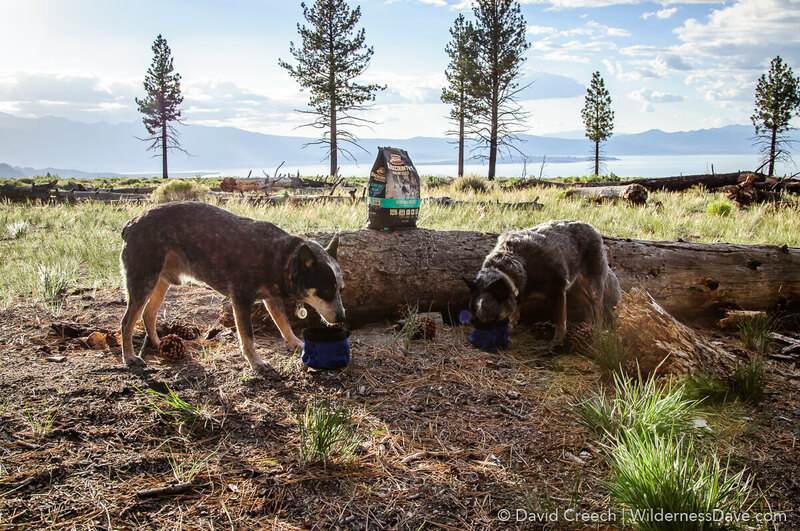 Merrick Backcountry recipes include healthy ingredients that make dogs healthier and happier companions. Quality proteins support growth and development in dogs and lead to increased energy levels. Grain-free ingredients avoid issues like gluten intolerances, chronic skin conditions and stomach distress. Fats and amino acids contribute to a healthier skin and coat. This nutrient dense formula allows for smaller servings and helps to optimize weight management. Max and Wiley have never really been casual about feeding time, they love to eat. But their excitement level has definitely gone up a couple of notches since we put them on the Backcountry product. Wiley (our oldest) is much more energetic about meal time and Max is much more focused and attentive. They are pretty crazy about their new food and they both have done well on it. The transition from their old food to Backcountry was pretty quick, we’ve seen no negative reactions in them and they seem very satisfied. We expected to see Wiley show signs of some reaction within the first few weeks if it was going to happen, but she is doing great. We’ll continue to watch both dogs for reactions or sensitivities to the food. But so far, we are happy to keep them on the Backcountry food from Merrick and the dogs are pretty happy about it too. Disclosure: We were provided product and compensation by Merrick Pet Care for this review. But, as always, I wouldn’t endorse, support, or write about anything I don’t love. All opinions are honest, unbiased, and mine (and the dogs’) alone.